Leopold Godowsky (1870‐1938) was one of the greatest and most legendary pianists of the 20th century. As a composer, he is most famous for his transcriptions and paraphrases, all displaying a daunting virtuosity. 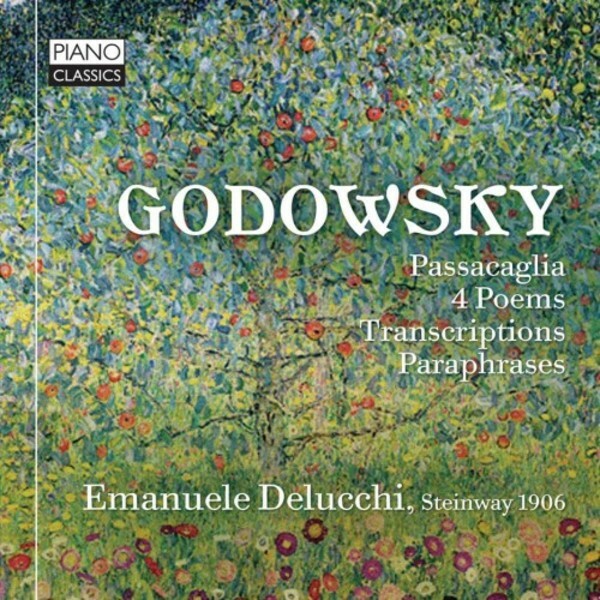 This new recording presents Godowsky�s original work the Passacaglia, 44 variations on Schubert�s Unfinished Symphony, one of the most complicated and difficult piano pieces ever written, as well as a selection of transcriptions of Schubert Songs. The Strauss paraphrases (Wein, Weib und Gesang, Alt Wien) are frequently played concert pieces, a firework display of virtuosity, ingenuity and brilliance. Pianist Emanuele Delucchi (b.1987) followed the famous Imola School in Italy, won the gold Medal at the Alkan/Zimmermann Competition and is a champion of lesser known romantic composers (Alkan, Godowsky, Bussotti), �A true lion of the keyboard, a discovery� (Matthias Ross). Delucchi plays on a Steinway of 1906 from the collection of Marco Barletta, an instrument perfectly suited to the repertoire, from the same time as Godowsky�s compositions.